It was all the build up. First wondering if I should do it. Then trying to find an excuse not to. I didn't have any. I was in the best of company. My brother, my all time diving buddy and my adventurous uncle. Then came the deluge of black berry comments: I was encouraged by the women and the men just teased because they didn't want to admit their own reluctance to dive into a tank with no less than 28 sharks. My cousin claimed I would scare the sharks! Then came the journey to the tank. Dead Woman Walking from the Dubai Mall garage to the aquarium. It was there, huge and blue. 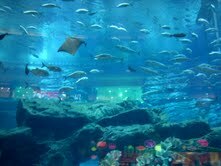 I glanced at the fish, at the giant sting rays, at the sharks and my tummy had knots. Before I knew it I was dressed in a wet suit, my uncle even recommended a head gear because the temperature is at 20c. 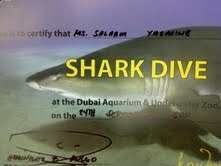 They told us about all the dangers, they debriefed us about our behavior around sharks. My heart rate was high. There was no turning back. Not after all the bb messaging! As my dive buddy brother wrote: "U can thank me later, I am giving u stuff to talk about other than bikram/pilates and golf." He may not be far from the truth! I didn't feel the water temperature. I was in a zone. I kept saying: " its just a pool. If you can figure out how to breath and use the tank, you will do well. Besides you have your two body guard relatives. They won't let you get scratched, forget about a bite!" I thought of my girlfriend who recommended one or two bikram positions for my self defense. Predictably, I began to overthink the whole technique of diving, forgetting the main reason of my fear. What I knew deep down was that I had to remain calm. I could not afford to have a panic attack and have to shoot up to the surface because the water would stir and I didn't want to stir the attention of any predators. The first thing I saw when I reached the bottom of the tank were my children, my nephew, my sister-in-law, my friends, through the tank glass. They had all come in a large group of support and I waved at them in reassurance. I wanted to make sure the children didn't read my fear. 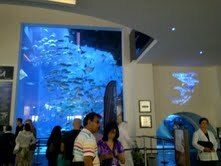 I was amazed to be a "fish in an aquarium". The tourists in their Dubai t shirts, waved at us, took pictures of us, perhaps amazed at our craziness. I looked out to see Dubai Mall, its hustle and stores. It was a funny sight to see things inverted. 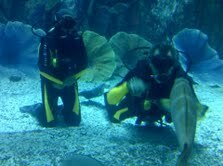 The divers that prepped us had told us not to make too many hand gestures. I heeded their advise literally and sat in the tank with my arms tight around my waist. My eldest son kept telling me to relax them through the tank window. It was then that I realized that I was surrounded by fish, fish and more fish and amongst them were the gray sharks, swimming around. The giant rays "flapped their wings", their dangerous stings behind them. I was very conscious now of where I was but I had no fear. 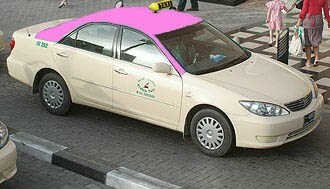 Like most experiences in Dubai, I sensed the "controlled environment". There were 28 sharks, but they were fed and they were used to divers looking for a thrill. I discovered that sharks are scarier when you see them from outside the tank because in the depths they almost blend in with the other fish. At one point, I was isolated with my uncle when a shark swam above us, its shadow covering us. They had warned us not to blow bubbles when that happened. I read my uncle's mind because we both held our breath for the 30 long seconds and I could sense him laughing at my renewed fear. I did come eye to eye with a shark, but only for a couple of seconds. It was the thrill of my life. I left the tank reluctantly but relieved (if those two feelings can be compatible). I don't think I can ever be in such a controlled environment, "with such a multitude of animals" as my brother remarked. I am happy my first encounter with sharks was upon my own decision. I made the call! Next time I happen to see one, per chance, in the real ocean, I believe I will be more in control of my reaction because it wouldn't be a first sighting. Long after I dried up and shared my experience with my brother and uncle, the latter said: "the sharks are predators. They seem calm. They swim silently. The speed of their attack is like lightening." I took a long deep breath, on dry land....and wondered if I would do it again. My big sis is way cool!